The leading neoconservative think tank Foundation for Defense of Democracies is functioning as an agent of the Israeli government, Al Jazeera’s forthcoming investigation on the US Israel lobby will reveal. Al Jazeera’s film reportedly identifies a number of lobby groups as working with Israel to spy on American citizens using sophisticated data gathering techniques. The documentary is also said to cast light on covert efforts to smear and intimidate Americans seen as too critical of Israel. Sima Vaknin-Gil, who holds the rank of brigadier-general in Israel’s military, is now the top civil servant at Israel’s Ministry of Strategic Affairs. Vaknin-Gil’s ministerial boss is Gilad Erdan, a close ally of Israeli Prime Minister Benjamin Netanyahu. Soon after she was appointed to lead the ministry at the start of 2016, Vaknin-Gil promised to “create a community of fighters” who would “flood the internet” with Israeli propaganda that would be publicly distanced from the government. As well as getting funding from Sheldon Adelson, the anti-Palestinian billionaire and number one donor to Donald Trump’s presidential campaign, the Foundation for Defense of Democracies has close ties to the United Arab Emirates. The film will also reportedly show undercover footage of a junior Israel lobbyist boasting of how close Israel’s ties are with the United Arab Emirates and other Gulf regimes. Information removed from Max Adelstein’s Facebook page. Click here for full resolution. Adelstein was an intern at Washington lobbying firm the Harbour Group. The firm’s clients include the United Arab Emirates and Saudi Arabia. According to The Electronic Intifada’s source, Adelstein is seen in the undercover footage explaining that an American Jewish Committee “study tour” of the United Arab Emirates focusing on “mutual cooperation” was planned. The additional insight into the United Arab Emirates’ cozying up to Israel lobby groups comes as the wealthy monarchy’s activities in Washington are facing renewed scrutiny. 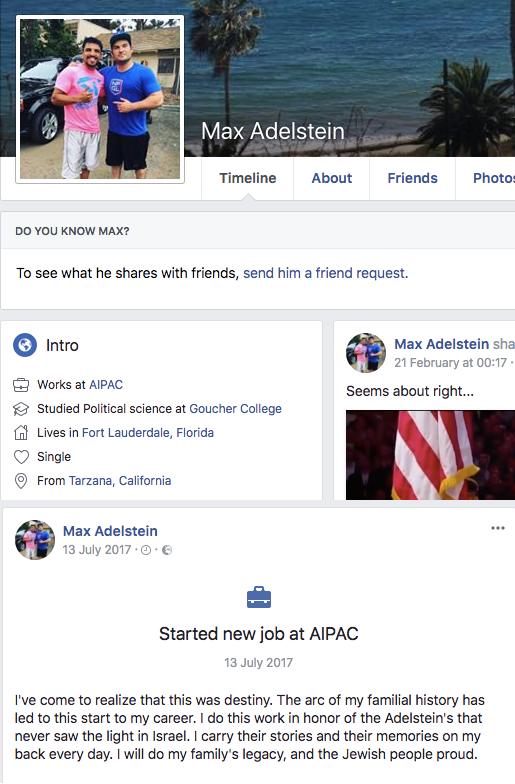 A photo from AIPAC staffer Max Adelstein’s Facebook profile, which has now been made private. On Saturday, The New York Times reported that special counsel Robert Mueller is expanding his investigation from alleged Russian meddling in the US presidential election to “include Emirati influence on the Trump administration” through the president’s son-in-law and adviser Jared Kushner. In October last year, Clayton Swisher, Al Jazeera’s head of investigations, first announced that the Qatari satellite channel had in 2016 run an undercover journalist in the US Israel lobby. Although Swisher promised the US film would come out “very soon,” nearly five months later it has yet to be broadcast. Among them have been some of the most rightwing and extreme figures among Israel’s defenders in the US, including Harvard law professor Alan Dershowitz and Morton Klein, the head of the Zionist Organization of America. Multiple Israel lobby sources told Israel’s Haaretz newspaper last month that they had received assurances from Qatari leaders late last year that the Al Jazeera documentary will not be aired. Updated to add Max Adelstein screenshots.